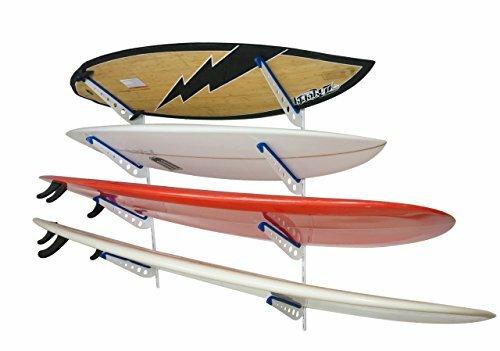 Made by StoreYourBoard, the leaders in outdoor sports gear storage, this Surf Rack is an adjustable wall storage solution for all your surfboards at home! The Rack consists of 2 wall tracks and 4 sets of rack arms. The rack arms can be inserted in the tracks at whatever setup you need to accommodate your boards. Space your rack levels apart to accommodate fins, thicker boards, or your storage space. Made of steel, this Surf Rack can hold most all surfboards on the market, from shortboards to longboards, and everything in between, like fish, funshapes, wavestorms, Catch Surf boards and more. NOT intended for SUPs. Space the tracks apart at the width you need to fit your length of surfboards. Mounting this rack to your wall is quick and easy. Simply insert 4 screws through each track into your wall's studs, then insert the rack arms and you're ready to store your boards. A quick hammer tap to the top of each rack arm inserts the arm firmly in place. All the hardware you need to install the rack is included. This racks holds more than surfboards! Use it to store your wakeboards, snowboards, skis, skateboards, and anything else you've got in your garage (tools, fishing rods, beach chairs, etc.). -60 degree upward angle of arms. ADJUSTABLE RACK SYSTEM. Insert the rack's arms where you want them along the track to accommodate different sized boards, fins, etc.